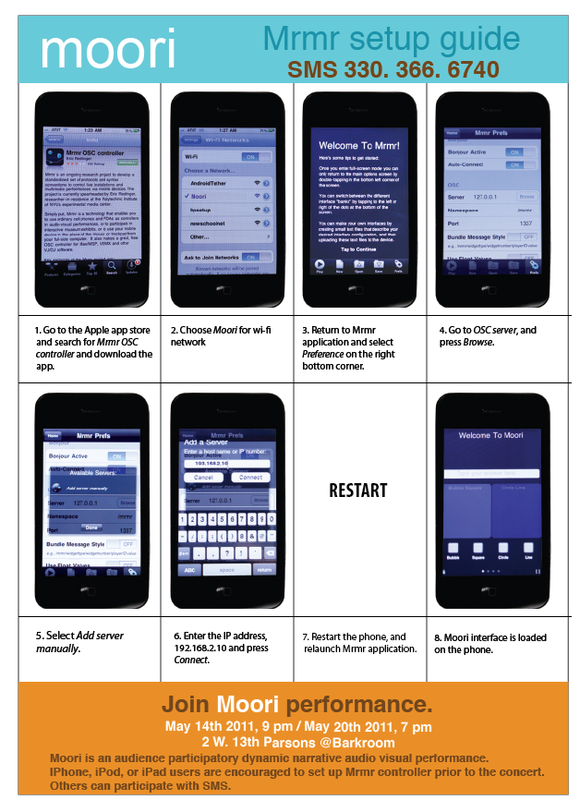 Mrmr is an open source OSC controller currently developed only for iPhone and iPod touch (http://mrmr.noisepages.com). Mrmr supports standard communications such as Bonjour Zeroconfig, mDNS, and OSC. It provides a multi user setup, and a customizable dynamic user interface. An interface can be designed either by using a text file or Mrmr Interface Builder, a graphical interface building application. 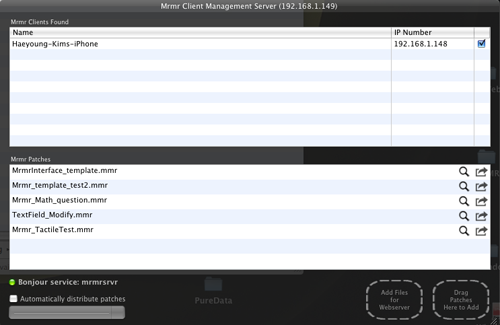 The Mrmr Server application displays connected network clients, and allows the performer to store, edit, and push multiple interfaces manually. 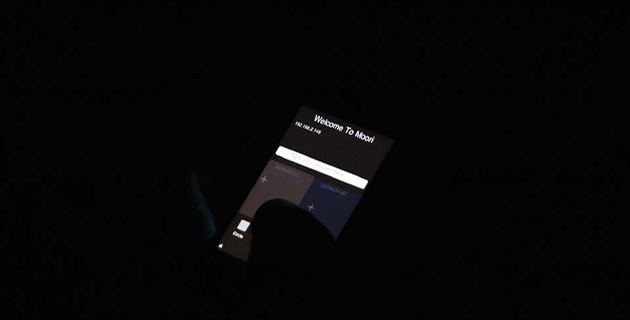 Incorporating Mrmr permits the Moori system to send and receive text data, and user interface widgets such as buttons, touch pads, and sliders. At first, Moori’s interface files were stored and updated from Mrmr Server application. After experiencing frequent crashes with the application during the performance, the Mrmr Server application was removed and its functionality was implemented directly in Openframworks. Moori’s interface displays instructions, a text input box, two touch pads, and four buttons. Users receive a new interface update each time a new instruction is generated. The buttons provide sound and graphic palettes. The graphics and sounds are mapped to the coordinates of two touch pads. Users toggle between two buttons (per touch pad) to select the type of graphics and sound. They then can move around cursor on the touch pad to invoke those elements. Since the interface provides two touch pads, two graphical and sonic pieces can be manipulated simultaneously.